A pair of soft, loose shorts like the ones I'm wearing below and a nice lightweight kimono along with a simple tank is such a staple summer outfit for me! I find the kimonos provide sun protection, add a little extra colour and print, and are a great way to layer without overheating. These outfits were perfect for our December heat. One of the kimonos I'm wearing isn't actually a kimono at all though! I got this beautiful big scarf as part of my brand rep role for fashion scarf girl. Being a massive scarf (100 cm by 180 cm!) I instantly thought of wearing it as a sarong for the beach. With no beach trips in the immediate future, I decided to double it over and knot the ends together to create a kimono. Not the first time I've worn a scarf as a kimono, it's a good way to change up the way you wear something! I picked the olive shorts as they kind of met the #DAREcember style challenge prompt of 'in the jungle', being an olive colour. And also because it was a hot day with a lot of running around to do and these are so light to wear. I ran a few errands with the boys, including buying a secret Santa gift for a Christmas dinner with friends. 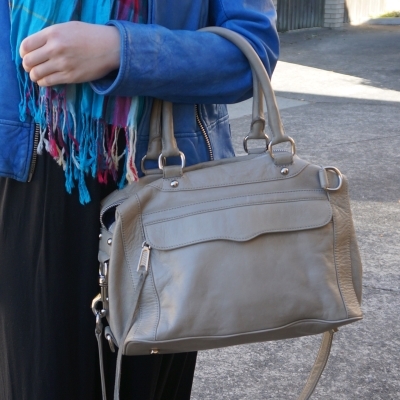 With the olive shorts and all the colours in the scarf, I thought the neutral Rebecca Minkoff MAM was a good bag to compliment it. Holds a lot of things too! 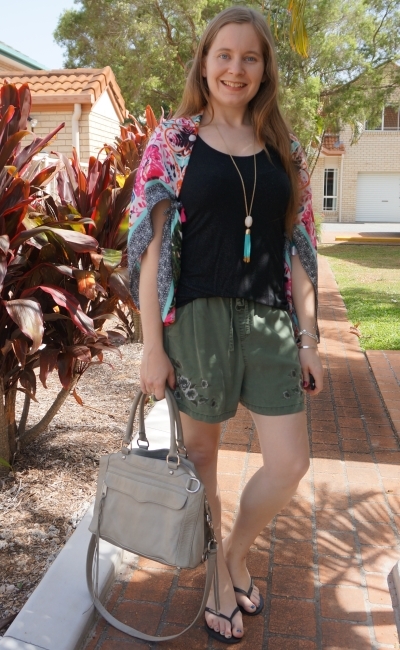 Last worn: black shimmer tank, tassel necklace, olive embroidered shorts, Havaianas, Rebecca Minkoff MAM bag. First time I've worn the scarf as it is a recent addition to my wardrobe. Other ways to wear: black shimmer tank and printed jeans, olive embroidered shorts in autumn, Rebecca Minkoff MAM bag in the office. 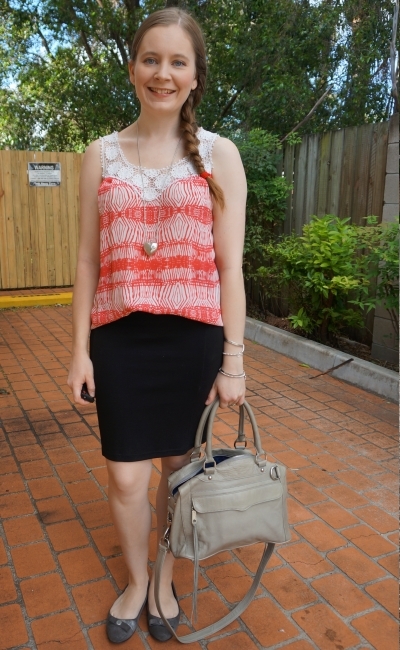 Perfect for pregnancy: black shimmer tank in first trimester, Rebecca Minkoff MAM bag in third trimester. This was such a hot day! We planned to put up out Christmas tree in the afternoon (I wore this back at the start of December). There was a new walking trail I wanted to try out first, so we set off early in the morning before the heat got to be too much. Since it was a sunny day, I added the kimono for a little sun protection as I wasn't sure how shaded the track would be. While the walk was short, it was worth it, beautiful views! While it was a bit warm for closed in shoes, and I kicked them off as soon as I got home, the Converse were good for walking. I was glad the walk was short as it was so hot! Will definitely attempt it again later when it's a little cooler. It's not the first time I've tried this floral kimono with another print, it's great for print mixing with. 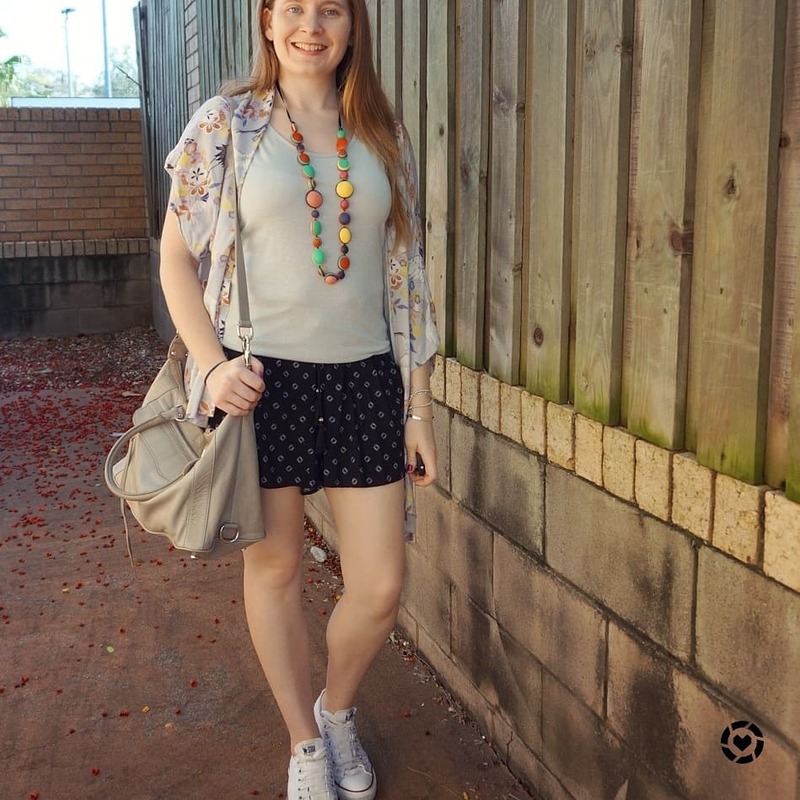 With the black shorts, grey kimono and silver tank I felt the outfit needed a little colour - this pretty Ruby Olive necklace that my bestie got me from Christmas was the perfect addition. Met the 'dotty' style challenge prompt nicely for that day too. Last worn: grey floral kimono, silver tank, black printed shorts, Converse, Rebecca Minkoff MAM bag (above). Other ways to wear: grey floral kimono worn 30 ways, silver tank worn two ways, black printed shorts in monochrome outfit, Converse and printed dress, Rebecca Minkoff MAM bag worn 30 ways. Perfect for pregnancy: grey floral kimono in third trimester, Converse in second trimester, Rebecca Minkoff MAM bag in third trimester. 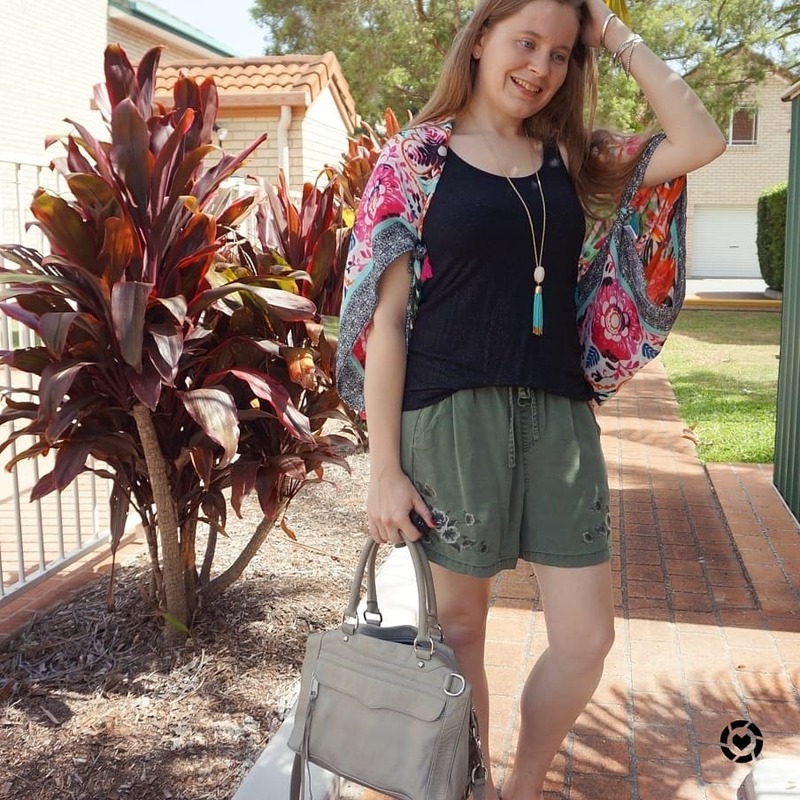 Soft shorts are ideal for a hot summer day, and a colourful kimono is a lovely extra layer that will add further interest to your outfit without over heating you. 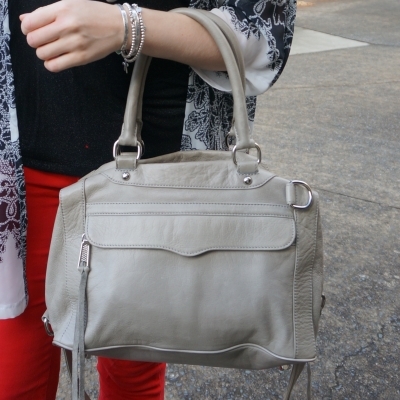 Neutral accessories like basic tanks and grey bags are good pieces to pair with a loud printed kimono too. A simple bright tank and denim shorts is an easy summer staple outfit. For something a little different, I like to add some extra colour or print with accessories. 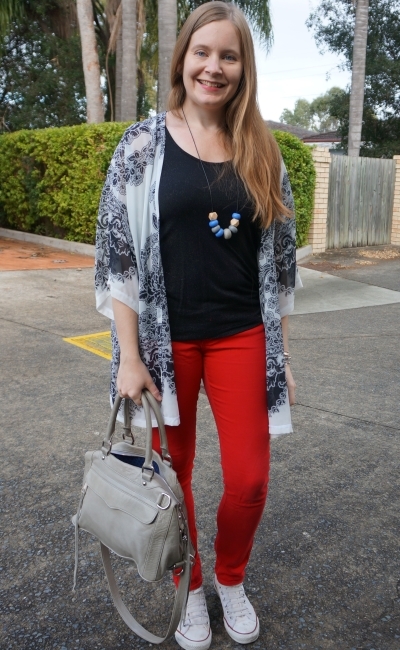 A kimono, printed bag, or as I've worn here a printed scarf, is a fun extra touch to your outfit. Both of these scarves are lightweight and perfect for a milder summer day. This was an absolutely crazy day. 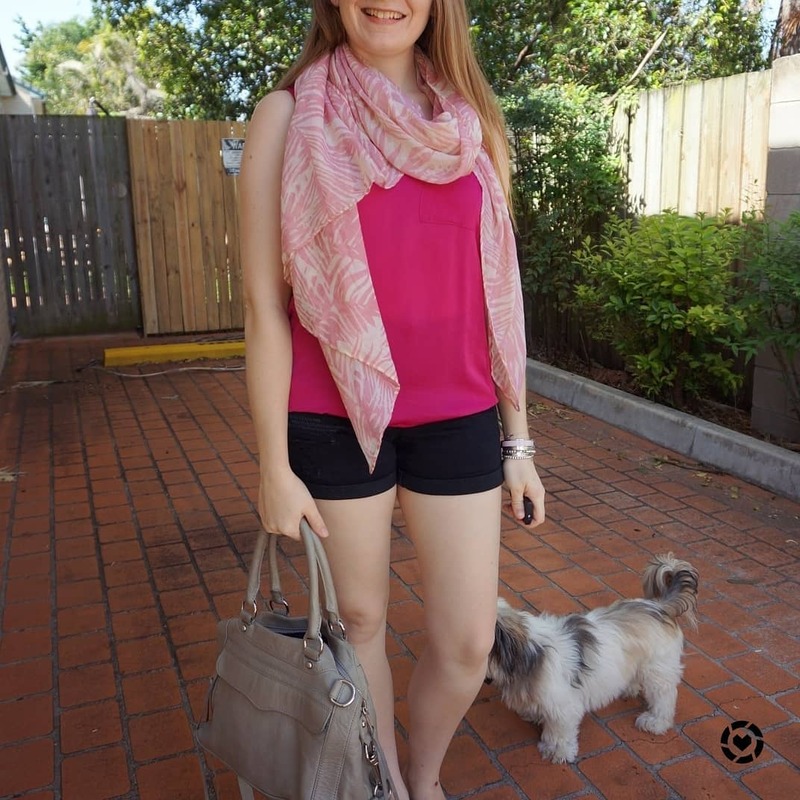 Usually on a crazy busy day I'd stick with a comfortable tried and true outfit, but I decided at the last minute to try something a little different and add this pale pink leaf print scarf to the hot pink tank. While it was a hot day, it was a very windy one so the scarf was a great accessory to have. Particularly when the dust picked up. I had to drive into the city for an appointment and it was an interesting drive - some of the remnants of the dust storm had reached Brisbane and everything was very hazy. Which lead to a lot of questions from the kids in the back seat about why the city was so 'misty'. And a very dirty car - although I wore this back in November - like everyone else in Brisbane my car stayed covered in red dust for a few weeks! With the pink on pink, the neutral Rebecca Minkoff MAB bag seemed like a good choice, and it held a few things I needed for the appointment. Perfect for running errands after too. 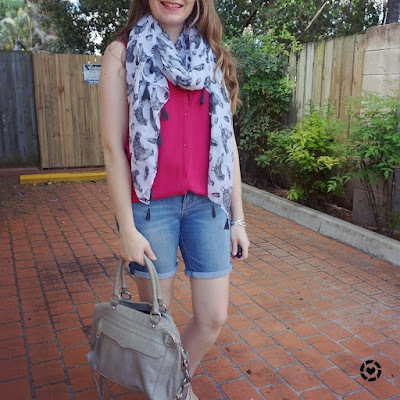 Last worn: leaf print scarf, pink tank, black denim shorts, Hermes clic clac, Havaianas, Rebecca Minkoff MAM bag. Other ways to wear: leaf print scarf worn as a kimono, pink tank and cobalt, black denim shorts and kimono, Rebecca Minkoff MAM bag and maxi dress. 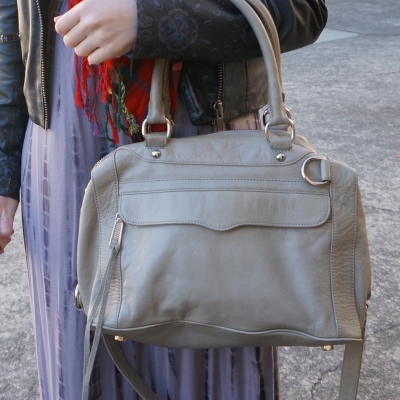 Perfect for pregnancy: pink tank in second trimester, Rebecca Minkoff MAM bag in third trimester. A very similar outfit formula to the one above, again with a pink tank and denim shorts. 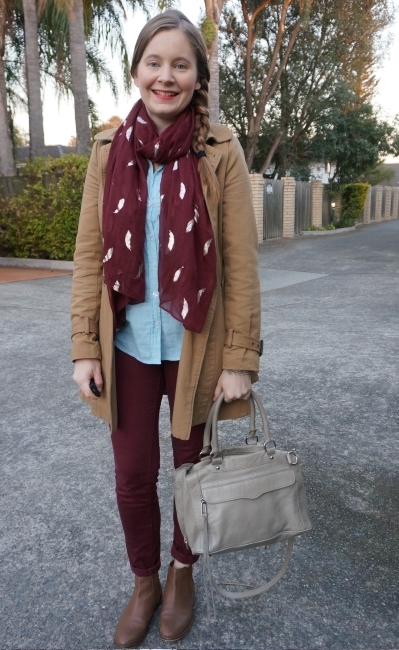 I added this fun chicken and egg print scarf for a little extra interest with the otherwise plain outfit. Unlike the day above, this was a much more relaxed day with the boys. We headed out to the library for rhyme time and then stopped at a few stores on the way home to run some errands. Being in aircon for most of the day, the scarf was a good extra layer to stop it feeling too chilly in the shopping centre. Last worn: bird print scarf, pink button up tank, Bermuda denim shorts, Havaianas (above), Rebecca Minkoff MAM bag (above). Other ways to wear: bird print scarf and pencil skirt, pink button up tank and flares, Bermuda denim shorts and embroidered blouse, Rebecca Minkoff MAM bag and dress. 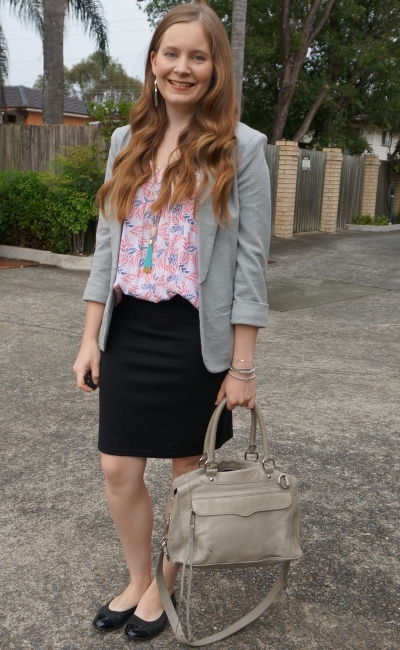 Perfect for pregnancy: pink button up tank in first trimester, Rebecca Minkoff MAM bag in third trimester. A plain tank and denim shorts is such an easy summer staple outfit. If you want to change things up a little between wears, try throwing on a cute scarf for some extra interest to your outfit. If it's a cooler summer day or you're spending a lot of time in the aircon it will make you a little warmer too! Light fabrics like viscose are best for scarves you want to wear in summer. For something a little different from the jeans rut I'd fallen into, I pulled out my maxi dresses, layering them up to make them more winter weather appropriate. I love wearing my maxis year-round. To be fair, we don't have snow in Brisbane which makes them a more suitable choice, especially when worn with leather jackets, ankle boots and colourful tartan scarves to keep me cosy! 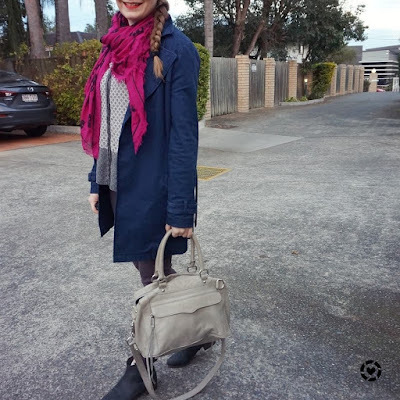 The tartan scarf was a fun way to add a little more colour and print to my outfit - and it kept me warm while we were outside playing in the playground at playgroup. 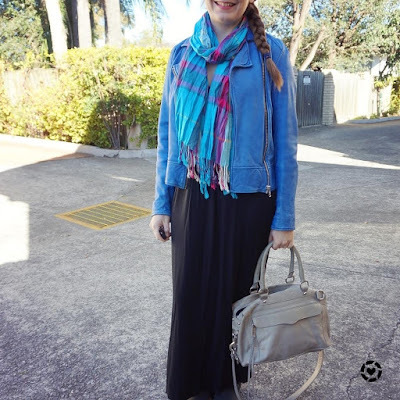 Even with the tie dye print on the maxi dress, the subtle blue and grey print on the leather jacket, I felt this extra print wasn't too much and just completed the outfit nicely. It's such a pretty scarf. 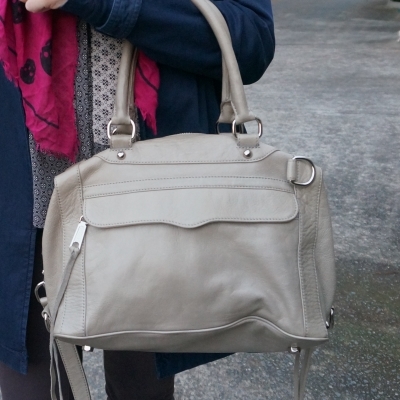 Picked my neutral grey Rebecca Minkoff MAB to wear with this as it's the perfect bag for running around outside with the boys - easy to throw it on cross body with the long strap. And the grey worked perfectly with everything else going on in my outfit. 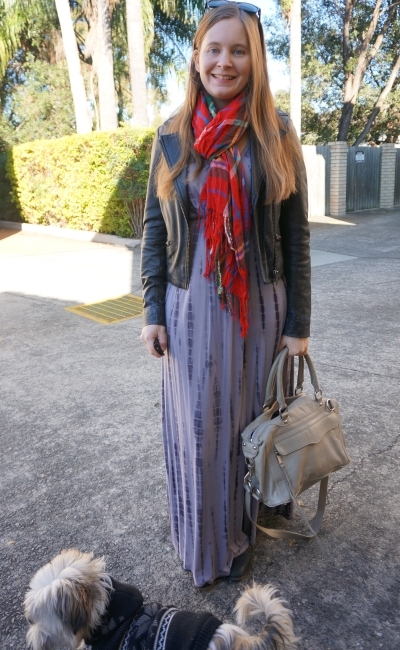 Last worn: printed leather jacket, red tartan scarf, tie dye maxi dress, RMK ankle boots, Rebecca Minkoff MAM. Perfect for pregnancy: red tartan scarf in first trimester, tie dye maxi dress at 38 weeks, RMK ankle boots in second trimester, Rebecca Minkoff MAM in third trimester. Just for fun I thought I'd add this tag video I did recently - my friend Tess from NaptimeNigella tagged me to answer 50 different questions. Nice way to find out a little more about me! Since I liked the outfit formula above so much, I did what I frequently do and copied it again to wear it with different pieces. I picked a plain black maxi dress this time, with the bright cobalt leather jacket and the only print in the outfit was my blue tartan scarf. I think this outfit worked really well. I've worn and liked the scarf and jacket together before, so it was an easy option when wondering what to wear with this dress. 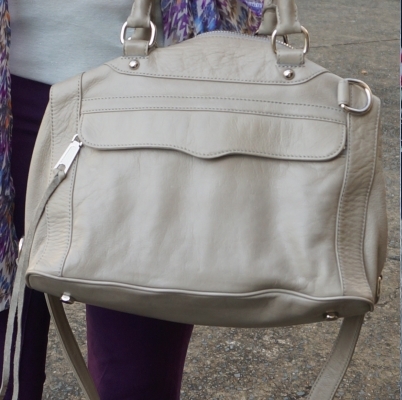 Again, I kept things simple with the bag, sticking with the neutral Rebecca Minkoff MAM. We took the boys into the city for something a little different. It was quite a big day for them, as afterwards we went over to my friend's place to watch Church Online together. The boys were definitely exhausted at the end of the night! The day was lots of fun though. 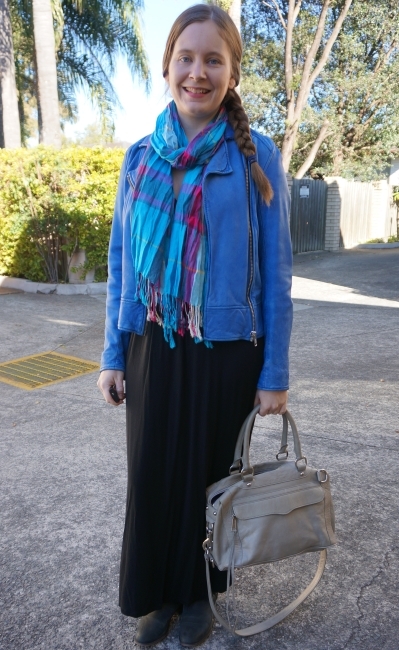 Last worn: cobalt leather jacket, blue tartan scarf, black halterneck maxi dress, black ankle boots (above), Rebecca Minkoff MAM bag (above). Other ways to wear: cobalt leather jacket and printed jeans, blue tartan scarf and double denim, black halterneck maxi dress and kimono, black ankle boots and pencil skirt, Rebecca Minkoff MAM bag worn 30 ways. Perfect for pregnancy: tartan scarf in first trimester, black halterneck maxi dress in second trimester, black ankle boots in second trimester, Rebecca Minkoff MAM bag in third trimester. 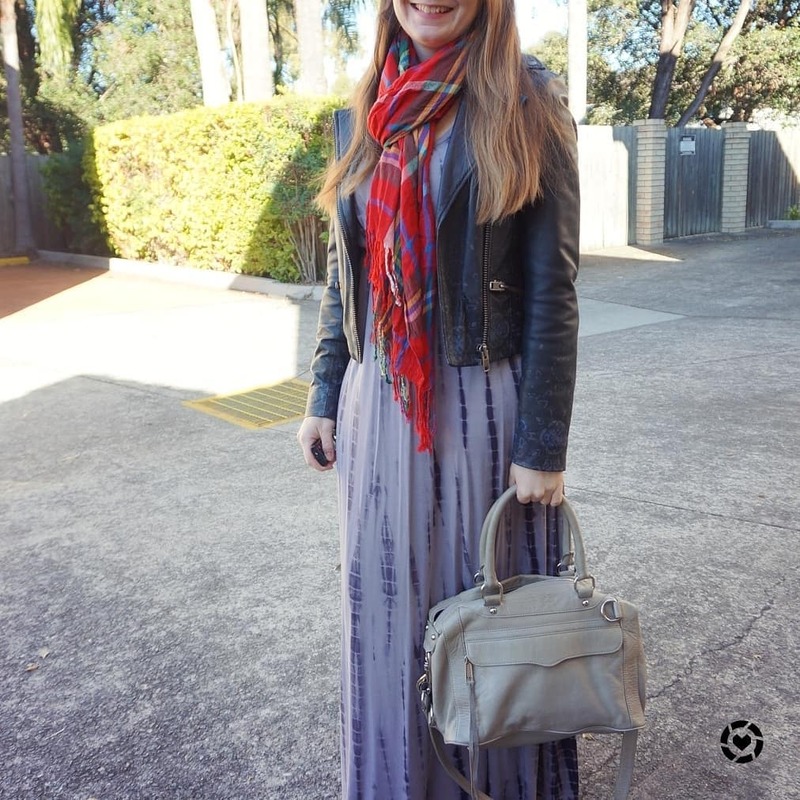 Maxi dresses don't have to be confined to the summer months! With some winter essentials like boots, a leather jacket and a cosy scarf, you can make them work for winter. Colourful tartan (aka plaid) scarves like these add a bit of colour and fun to a winter outfit too, and are a great pop against neutral dresses. Linking up with Weekend Linkup, Lizzie In Lace, Shoe & Tell, On Mondays We Link Up. Do you ever hit that point in a season where you're just over it, uninspired and dreaming of other weather? I hit that point in winter recently. I was cold and uninspired so I defaulted to my go-to outfit of jeans! The beauty of working in a business casual office environment is the ability to wear jeans through the week. Well, burgundy pants and a pair of grey jeans. Add some ankle boots, cosy scarves, and printed shirts and it's easy office style for winter. I usually plan my outfits the evening before I wear them. I'm not always organised enough to plan much further in advance! The night before I was cold, tired and wanted something easy. These burgundy pants are warm, and I've worn a very similar outfit before. 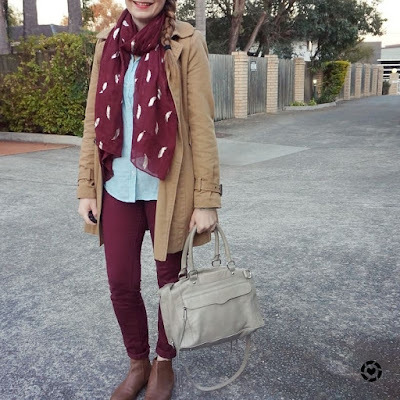 The tan boots, camel trench and burgundy pants just work perfectly together, especially with the burgundy scarf and the neutral Rebecca Minkoff MAB. I've worn all these pieces together previously here, but this time for something different I picked another top. Again, mint and burgundy is a colour combination I've tried before, although it's the first time I've worn this shirt with the pants. I really liked this outfit - being a combination of colours and pieces I've tried before, I knew I would, and it was just what I needed for an otherwise uninspired day. You know an outfit's good when your boss stops you in passing to comment on how much they love it! I did manage to somehow spill multiple meals on myself so my outfit got progressively worse through the day, but otherwise it was a great outfit and a good day. Realising I'd spilled my drink over both my top and my pants after presenting a meeting wasn't a highlight (I missed my sleeve in the clean up and just noticed the pants!) but thankfully no-one said anything, if they did notice. Last worn: camel trench, burgundy feather foil scarf, mint stripe shirt, burgundy pants, Chelsea boots, Rebecca Minkoff MAB. Other ways to wear: camel trench and fit and flare dress, burgundy feather foil scarf and little black dress, mint stripe shirt and denim shorts, burgundy pants worn 2 ways, Chelsea boots and floral dress, Rebecca Minkoff MAB and maxi dress. Perfect for pregnancy: camel trench in first trimester, mint stripe shirt in second trimester, burgundy pants in second trimester, Chelsea boots in second trimester, Rebecca Minkoff MAB in third trimester. What my MAB looks like now, after 5 years of wear! Another outfit following the same outfit formula - printed shirt, cosy coat and colourful pants. I like that these jeans are a muted purple-y grey colour, they don't look as obvious as blue denim but are still just as comfortable. While jeans are definitely not frowned on during the week (and you see a lot of blue denim around mid-week in the office) I only pick these jeans to wear on quiet days where I won't be presenting much. We had a busy day, I was working on another initiative outside of my usual work with a smaller group, so the casual jeans were perfect. Comfortable too. With the mixed print on this shirt I wasn't completely sure what scarf to go with, went with this magenta one in the morning at the last moment as I liked the colour it added with the navy macintosh. It was actually a warmer start to the morning - a sign winter is coming to an end! - and I debated leaving the scarf behind. I was able to leave my macintosh at my desk when we all went out for lunch, such a warm afternoon. The little exposed ankles I had from rolling up my jeans didn't make me as cold as when I did the same thing in the first outfit above! Last worn: navy macintosh, purple skull scarf, mixed print shirt, shale skinny jeans, black ankle boots, Rebecca Minkoff MAB (above). Other ways to wear: navy macintosh and fit and flare dress, purple skull scarf and polka dots, mixed print shirt and metallic jeans, shale skinny jeans and blazer, black ankle boots worn 30 ways, Rebecca Minkoff MAB worn 30 ways. Perfect for pregnancy: purple skull scarf in third trimester, shale skinny jeans in second trimester, black ankle boots in second trimester, Rebecca Minkoff MAB in second trimester. 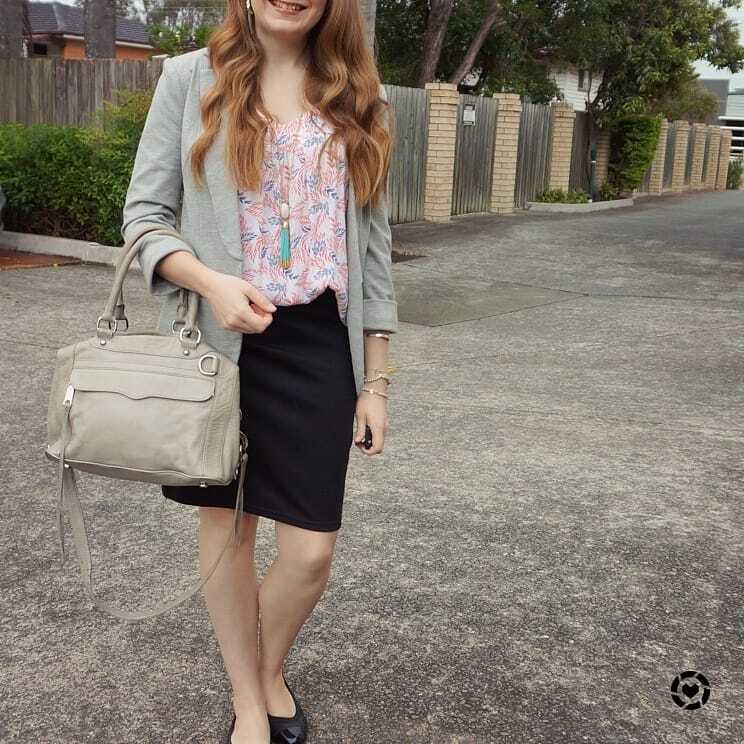 In a business casual office, you have a lot more options when it comes to workwear. You don't have to stick to classic black pants, and can experiment more with cuts like wide legs, culottes or skinnies. You might even be able to wear a pair of jeans like I have in the second outfit. Colourful pants are a nice way to stay warm in winter while keeping cosy at the same time, especially when paired with ankle boots and scarves. Linking up with Confident Twosday, Turning Heads, Trend Spin, Style On The Daily. There is something about the simplicity of a printed kimono with skinny jeans. Add in some shimmery tanks and you have such an easy stay at home mum outfit! 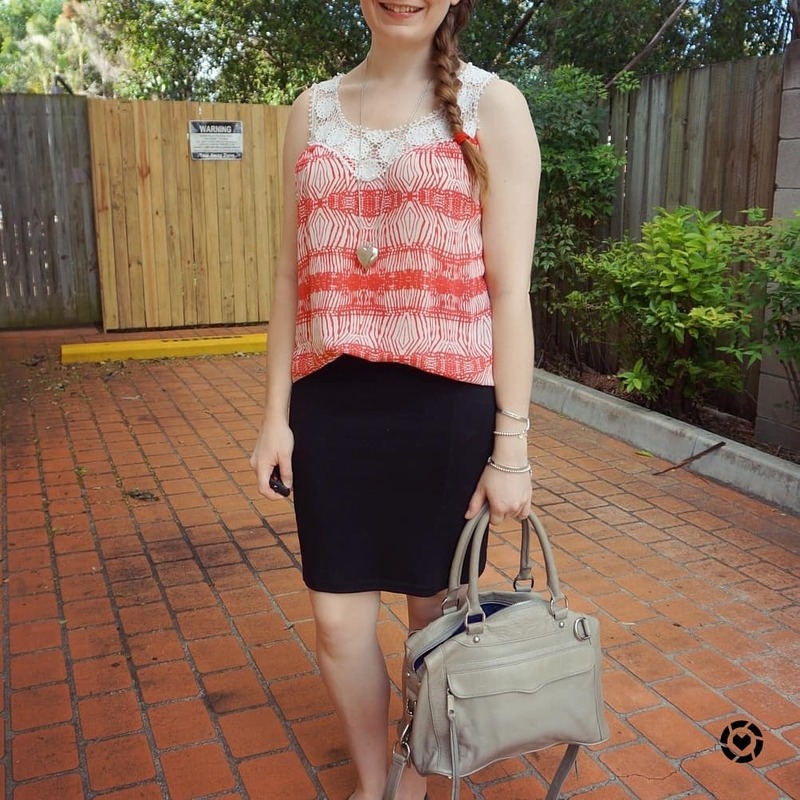 As I shared last week, I've been loving this kind of outfit formula before the cold winter weather arrived. Wore these outfits for two very fun days out and about with the boys, Converse were a necessity. As I had a few things to carry, I went with my trusty mini MAB bag. It carries everything! 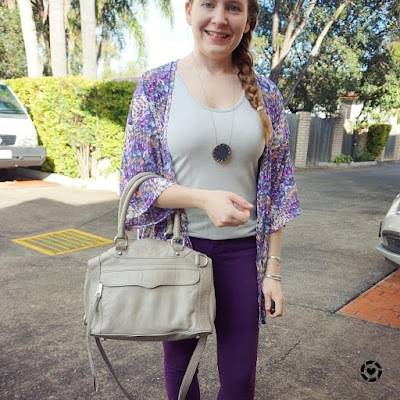 I worried the purple skinny jeans and printed kimono together might be a little too matchy-matchy, but I'm so glad I gave this a go as I really loved the combination! I debated wearing my trusty Havaianas over my Converse but figured it could still be quite a cold day. It wasn't, and a few times I regretted jeans and wish I'd gone with shorts! We headed down the coast with the boys to see the Gold Coast 'Monster Machinery' day. We'd never been before, but with two boys who love all kinds of vehicles, it was the perfect destination. Unfortunately it looked like most of the people on the coast thought so too, it was so busy! The council set up all their vehicles in a park, along with some emergency vehicles, boats, and Lightning McQueen and Mac from the Cars movies. The boys loved it! They ignored the biggest digger (although to be fair I wasn't going to push them to stand in the huge line!) abut they had fun clambering over everything including jumping into the big scoops and pushing the horns on some of the trucks and riding in the fire engine and ambulance. I loved my outfit, we had a fun day despite the crowds and lines, the only thing I didn't love was my bag choice. I specifically chose this much loved Rebecca Minkoff MAM bag as it fits everything I need to carry as well as my camera, and I'd planned to vlog the day. I took a cute video clip in the car on the way down and noticed the battery was getting low. Not an issue, it's pretty good and usually warns in advance. We finally found a parking spot, walked the long distance to the event, the boys got excited to see the vehicles, and I whipped out my camera to get a good pic, to realise the battery was dead. Luckily I had my phone, but the people waiting behind us to take a photo next were not impressed by my fumbling around! Last worn: printed kimono, metallic tank, purple skinny jeans, Converse, Rebecca Minkoff Mini MAB. Other ways to wear: printed kimono and maxi dress, metallic tank and leopard print, purple skinny jeans and winter layers, Converse for travel, Rebecca Minkoff Mini MAB and shorts. Perfect for pregnancy: purple skinny jeans in first trimester, Converse for second trimester travel, Rebecca Minkoff Mini MAB and maternity pencil skirt. Another outfit with the same outfit formula! Colourful skinny jeans, basic tank, kimono and Converse. This time I charged the camera the night before, so there were no surprises! I wasn't entirely happy with the kimono though - we had an early start and it was a bit chilly in the morning. Perfect for the rest of the day when it warmed up, but made me realise my kimono wearing days are getting less frequent now winter has arrived. With toddler T's birthday coming up, we decided to take him and his brother out for a Pony Playdate. A local organisation runs it, they have a beautiful paddock and some farm animals. It's Horses In Mind (not sponsored) at Hemmant. The boys got to spend a morning on the farm learning about (and yes patting and chasing!) the chickens and ducks and guinea pigs. Then it was time to learn how to take care of ponies, and they got to use all the different brushes to get them all nice and clean. This was magical, I had a go too and it was so fun brushing this little pony together. They were such good ponies! Then after they measured up my tiny boys for tiny saddles, they got to hop on and take the ponies for a ride around the paddock. We got so many good photos and videos, thanks to having the camera charged this time! It was such a fun day out. The white Converse might seem like a strange choice for a day on a farm! I'd picked them to wear over my boots as they had been getting a bit dirty and I'd been planning to wash them anyway. Getting covered in mud seemed like the best thing to do before finally throwing them in the wash a few hours later. 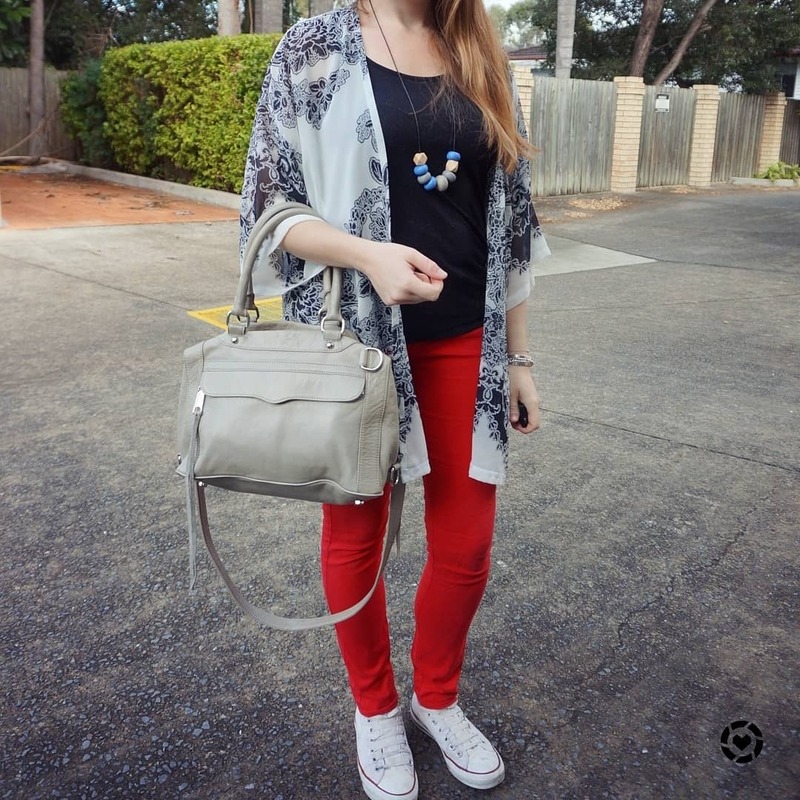 Last worn: black and white kimono, shimmery tank, red skinny jeans, Converse, Rebecca Minkoff MAM bag (above). Other ways to wear: black and white kimono and maxi dress, shimmery tank and maxi skirt, red skinny jeans and rainbow knit, Converse and dress, Rebecca Minkoff MAM bag worn 30 ways. 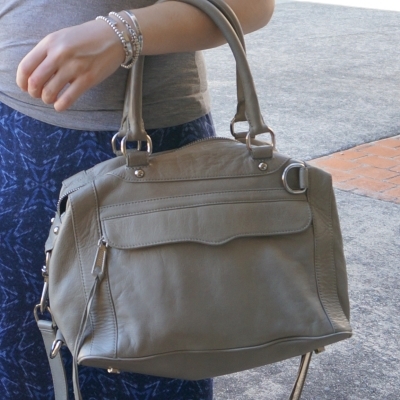 Perfect for pregnancy: shimmery tank in first trimester, red skinny jeans in second trimester, Converse and maternity shorts, Rebecca Minkoff MAM bag in second trimester. Colourful jeans don't have to be tricky to wear! They can be just as versatile as your standard blue jeans. You can match the colour to something else in the outfit like I did with the purple jeans and kimono together in the first set of pics, or you can keep things simple and add a pair of colourful red jeans to a classic black and white outfit. Easy, fuss free dressing that's perfect for a day running around with kids. Linking up with Flashback Fashion, Lizzie In Lace, Friday Faves, Shoe & Tell, Mix It Monday, On Mondays We Link Up. Slightly cooler Autumn weather, after what seemed like a never-ending summer heat, brought me the opportunity to layer a little! I decided to try wearing some of my fave slouchy tees over my jersey maxi dresses. I've only worn a tee over a maxi dress once before, but I loved this combination and you can expect to see it pop up more frequently! We had a pretty quiet day planned when I wore this. Taking advantage of hubby having the day off, we took the boys to the doctors for their flu vaccination. It was helpful having another set of hands as injections are never pleasant! After the stressful morning, we took the boys out for lunch as a treat, then it was back home for massive naps from them both. It's not the first time I've worn the aqua mini MAC bag with burgundy (seen before here with burgundy pants), I really like the combination. 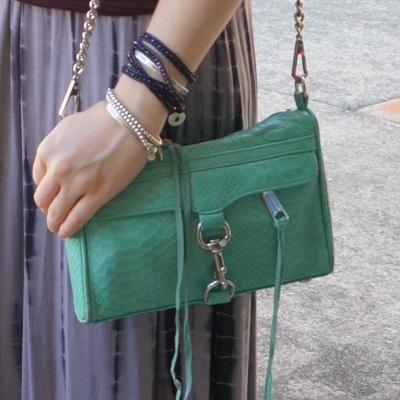 The mini MAC bag is worn frequently with this tie dye dress too. Loving all of these pieces separately and combined, I of course loved this outfit. So much that I repeated the formula again a few days later with different pieces as you can see below. 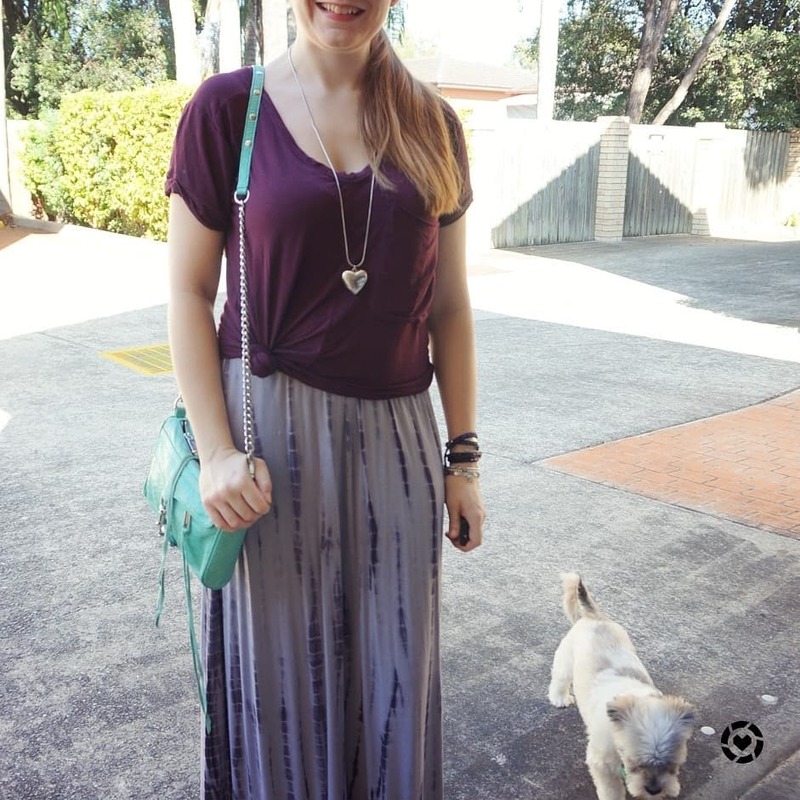 Last worn: burgundy tee, tie dye maxi dress, Havaianas, Rebecca Minkoff aquamarine mini MAC bag. Other ways to wear: burgundy tee and skinny jeans, tie dye maxi dress worn knotted, Rebecca Minkoff aquamarine mini MAC bag and purple jeans. Perfect for pregnancy: burgundy tee for second trimester travel, tie dye maxi dress in third trimester, Rebecca Minkoff aquamarine mini MAC bag at 39 weeks. We took the boys out to the Brisbane Kite Festival for something a little different! It was a lot of fun, as you can see from the video above. There were so many kites for the boys to watch, and we ended up buying and flying our own kite for a little bit too. It was the first time they'd flown a kite, and I don't even know how many years it's been since I flew one. 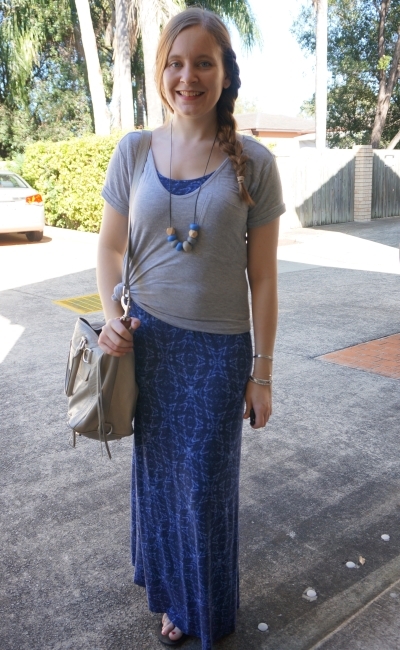 It was a really windy but sunny day, so I wore the knotted tee over a maxi dress outfit again. It was the perfect layer to act as a physical sunblock on my shoulders too, as I forgot a hat. I think my big sun hat would have flown off a few times if I'd worn it though. As mentioned in the video, I felt it was time to get my MAM bag out again. Someone had asked a question about it on YouTube so I'd filmed a video for it and didn't want to put it back in its dust bag without giving it a wear! 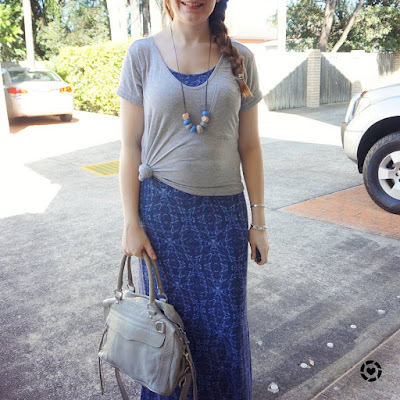 Last worn: grey v-neck tee, blue printed maxi dress, Rebecca Minkoff MAM. Other ways to wear: grey v-neck tee and printed jeans, blue printed maxi dress and matching bag, Rebecca Minkoff MAM worn 30 ways. Perfect for pregnancy: grey v-neck tee in second trimester, blue printed maxi dress at 39 weeks pregnant, Rebecca Minkoff MAM in third trimester. 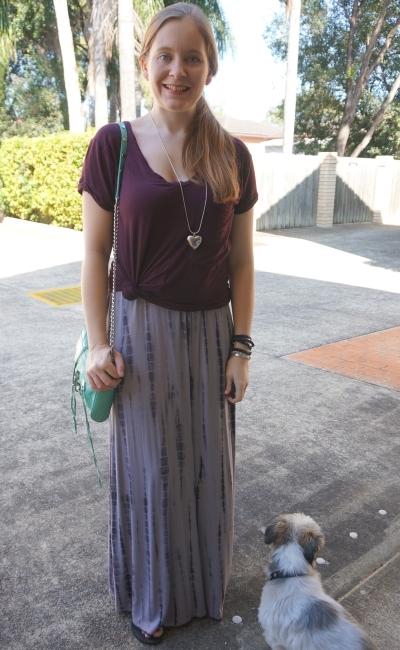 On a slightly cooler day a tee over a maxi dress is a great layering option, as it doesn't make you too warm. If your tee is long and slouchy, knotting it at the side is a great option to make it sit just right. Perfect for late spring or early autumn, it one way you can get more wear from your favourite summer maxi dresses. Linking up with Flashback Fashion, Lizzie In Lace, Shoe & Tell, Mix It Monday, On Mondays We Link Up, Modest Monday.